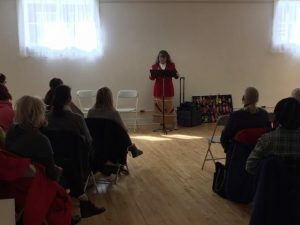 PICTON – Prince Edward County’s fifth annual celebration marking International Women’s Day has kicked off . Speakers addressed more than 50 event-goers at Picton’s Main Street cenotaph Wednesday afternoon to recognize the March 8 date – first observed in 1909 to commemorate progress made through the women’s rights movement. But, as advocates told guests during the day’s first event, the fight for equality continues – a fight especially pronounced for indigenous women in Canada. Carole Levesque, a member of Tyendinaga Native Women’s Association, said the gap is apparent within the country’s judicial system, where victims often fall through cracks. “There are a lot of murders that aren’t solved,” she said. Levesque, citing the ongoing issue of murdered and missing Indigenous women in Canada, added that the problem is fuelled by a mishandled cases and a culture of indifference from law enforcement. The event’s second speaker, Montreal’s Tamarack Verrall, echoed Levesque’s concerns and urged guests to push for equity between sexes. “Do not let anyone tell you that you are not equal to a man,” Verrall said. Verrall, who works to eradicate violence against women, added the day’s “spotlight” must also shed light on issues faced globally by women. 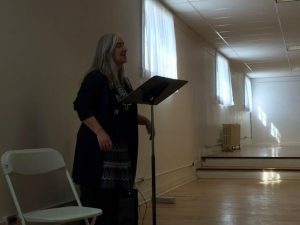 The day-long event is hosted by Alternatives for Women, a community-based group that has for decades offered counselling and sheltering for victims of domestic abuse. Women’s rights activist Tramack Verrall offers advice to young Canadian women from QNet News on Vimeo. Talks will be followed by a march at 6 p.m.